Oil on canvas, 138 x 119 cm. 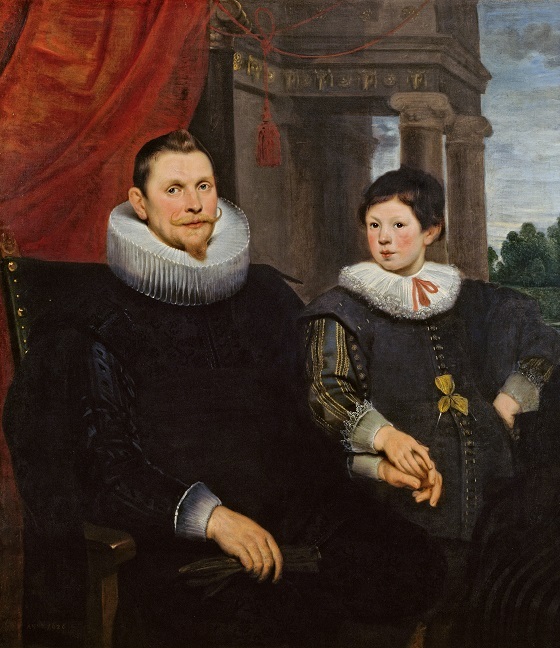 A father and son are impressively staged in this double portrait. They are surrounded by monumental columns and draperies and their clothing is distinguished. Both wear pipe collars – the father’s is large, while the son’s is a softer child’s version. Particularly the boy’s gold brocades, bows and cuffs testify to their position amongst the upper middle class. The relationship between the two is tender. The father’s soft gaze out towards the viewer is both gentle and proud, while the son tries to appear firm and manly. They hold hands in safe assurance that the line of succession has been secured. At the bottom right, traces of a black satin skirt are visible. Here, the wife and mother was originally depicted, but the work was cropped and partially painted over at an unknown date. De Vos earned his living painting portraits of the wealthy bourgeoisie. This was the primary genre he practiced and the one he is today best known for. In terms of style and composition, he was particularly inspired by contemporary Baroque artists such as Rubens and van Dyck, but he himself was not an innovator within painting. Although de Vos’ work belongs to the more factual and conservative side of the Dutch Baroque, he was a very popular and frequently employed portrait painter in his time. He specialised in large family portraits, and he was able to create a name for himself on equal footing with other great artists of the period in the Netherlands.